Nick Davies, producer at Project Gotham and Geometry Wars developer Bizarre Creations, has said that the studio plans to create more Blur games and develop the franchise. Davies said that they consider Blur to be "the start of a big franchise for Bizarre" and "plan" to develop more games in the series. Despite a rather ballsy marketing campaign that mocked Mario Kart and generally favourable reviews, the 'Mario Kart for grown-ups' racing game has had lacklustre sales. Davies attributed the poor sales performance to the fact that Blur was released at "a very busy time for racing games" and believed that the strong multiplayer component would give the game staying power. "It came out at the same time as ModNation Racers and Split/Second. It rates incredibly highly and it's a very popular game, and I think it's going to be a slow-burner. I think the multiplayer will stay for a long time and I think people will come back to that time and time again, long after some of the other games have gone back to the second-hand shelf" said Davies. Davies said that Bizarre isn't done with Blur and that they intend to make it the biggest racing franchise. "...it's always been the plan to make the number one racing franchise. That's as much as I can say!" The studio recently confirmed it was working on James Bond: Blood Stone after a leak outed the title just hours before the official announcement. BLUR is a great game and it would of been a top seller had it not come out 7 days after Red Dead Redemption IMO. Remember Blur? It was that awesome racing game that was basically Mario Kart for adults by Bizarre Creations. Unfortunately that development studio was shut down shortly after Blur's release. Well new footage of the last title Bizarre was working on has been revealed by Chris Davie, former art director for the studio. While it's obviously some sort of sequel for Blur, Chris never states that this was officially a sequel. He just refers to his footage as "an announced, unfinished project." 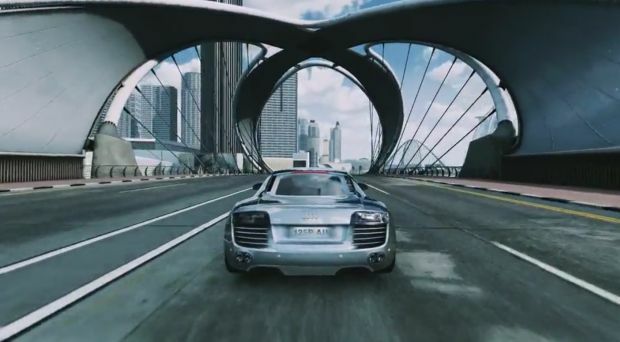 The first video showcases new visual effects the studio was tinkering with, such as how racing with intense weather effects would be like. The second bit of footage depicts a near complete stage set in Dubai. It also shows off a brand new engine that Bizarre had developed, but sadly never got to ship a game with. Despite the news of the studio closer, Chris continued to work on the Dubai stage as he felt it would be "a shame that nobody would get to play a finished track, even the dev team." He and a couple of others did what they could to develop the level right up until "the lights went out for good," but sadly never completed. My copy of Blur is still wrapped!